Contemporary jazz savant Maurice Brown has been a case study of the angelic tones a man and a wielded metal tube can produce over the course of his 36 years. 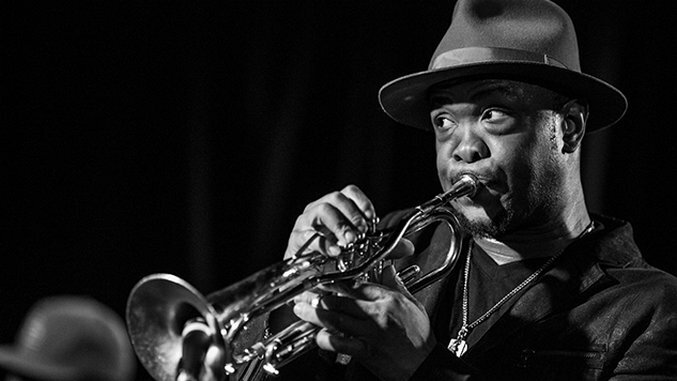 Encouraged early by Wynton Marsalis, trumpeter Brown has played alongside The Roots, Aretha Franklin and Santana among others, and can also be counted in the Tedeschi Trucks Band. Brown and his seven band members took over Chicago’s Martyrs’ venue last week, inviting Talib Kweli, Chris Turner, J. Ivy and Tarrey Torae to the jam. Photographer Sarah Hess spent the day with Brown, going to a recording at WGN before spending some downtime at his Airbnb (Pac-Man arcade cabinet included, because damn). The shoot culminated with a lively show that saw Brown, Kweli, Turner, Ivy and Torae at the top of their games. Check out the shenanigans in the gallery above.